What superhero-suited kid hasn’t uttered the magic word ‘Shazam!’, dreaming of being transformed into the adult-sized superhero of their wildest imagination? 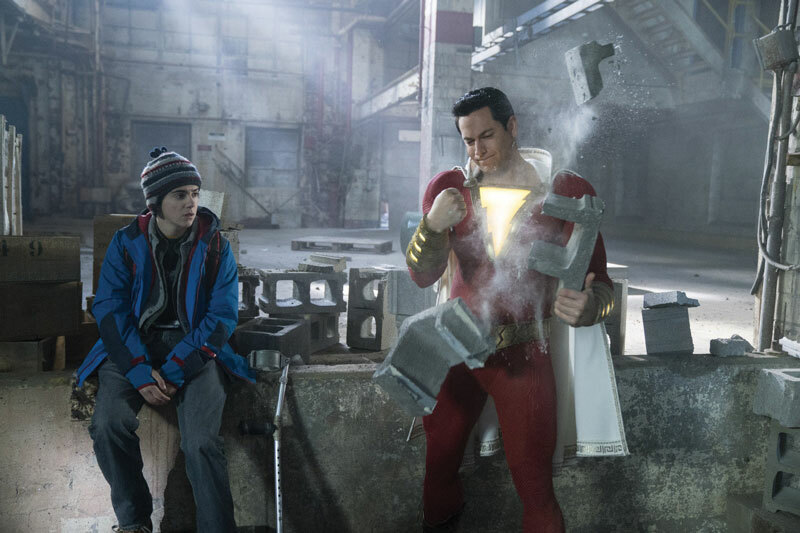 For Zachary Levi, that magic word came true as STACK discovers while visiting the set of Shazam! 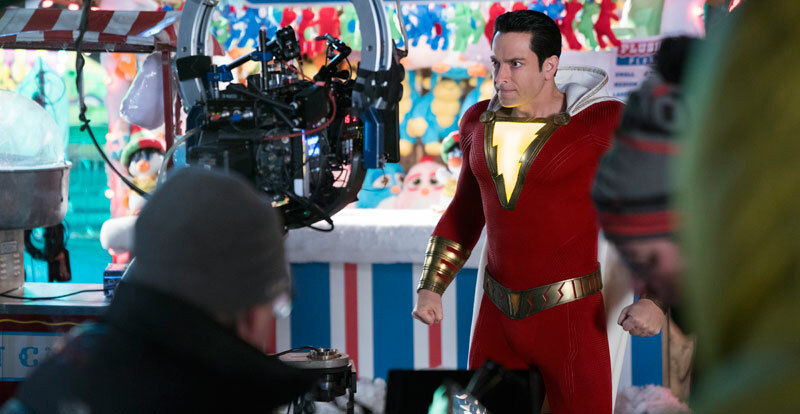 A self-described man-child – a little like Tom Hanks in Big – Zachary Levi, 38, brings a child-like wonderment to his grown-up-sized superhero conjured from the mind of teenage foster kid, Billy Batson. Sweating beneath a 35-pound padded spandex suit – resplendent with dazzling codpiece – Levi is genuinely giddy at this role of a lifetime. “Shazam is pretty unique in the whole comic world, because there are very few heroes that are really willing and excited heroes. They’re usually sitting around thinking, ‘Oh god, I have to save the world again’. But I’m such a kid when it comes to this stuff, so it’s cool that I get to play a role that incorporates my own genuine excitement,” he tells STACK when we chat in his trailer at Toronto’s Pinewood Studios, the sets doubling for Philadelphia. Standing at 6’ 4”, Levi is not short of examples of his inner child. “I try to be responsible but I’ve always loved to bring people joy. I have 80’s dance parties all the time at my house, and I have an open door policy. I still play video games and read graphic novels and I’ve got tons of energy, just like a kid. “I think the producers really wanted to find an actor with a childlike essence, and I think ultimately that’s why they chose me. “They trusted that I could put on the weight by going to the gym, that I could wear the suit and bring this 14-year-old to life. I’ve played a lot of different roles and most of them are family-friendly, so I started to get a little anxious because I wanted to get serious roles too. 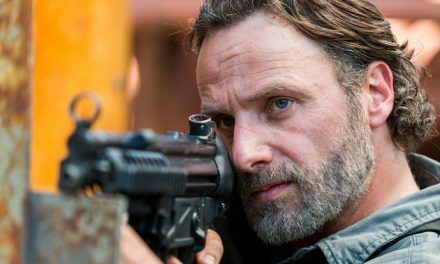 I thought maybe those family-friendly roles prevented me from progressing in my career, but it’s actually through those roles that I landed this one, which is my biggest role yet,” says Levi, best known for TV comedy series, Chuck, reprising his comic book character of Fandral in Thor: The Dark World and Thor: Ragnarok. In Shazam! 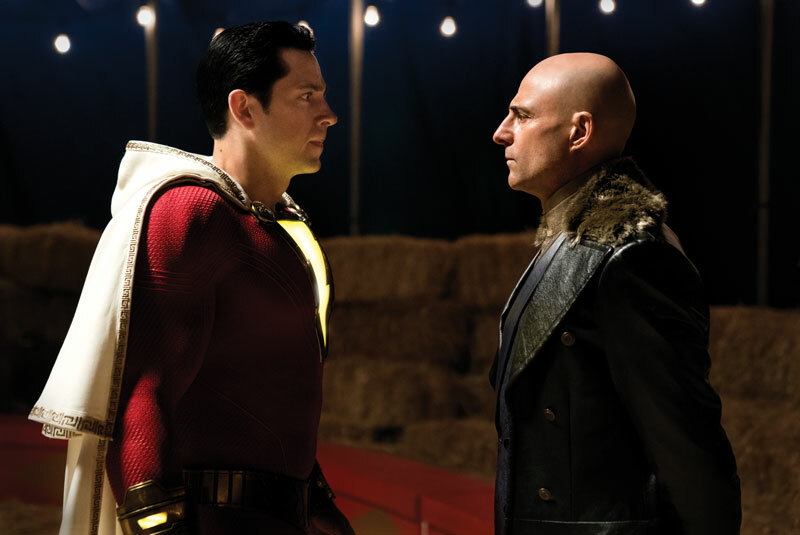 he goes up against Mark Strong’s villain, Dr Sivana, and the Seven Deadly Sins of Man, although he was too in awe of Strong to feel any lasting fear. If Levi emerges to save the day every time Asher Angel’s teenage boy, Billy Batson, utters the magic word ‘Shazam!‘, then the teen actor reckons he’s the more mature half of the alliance. 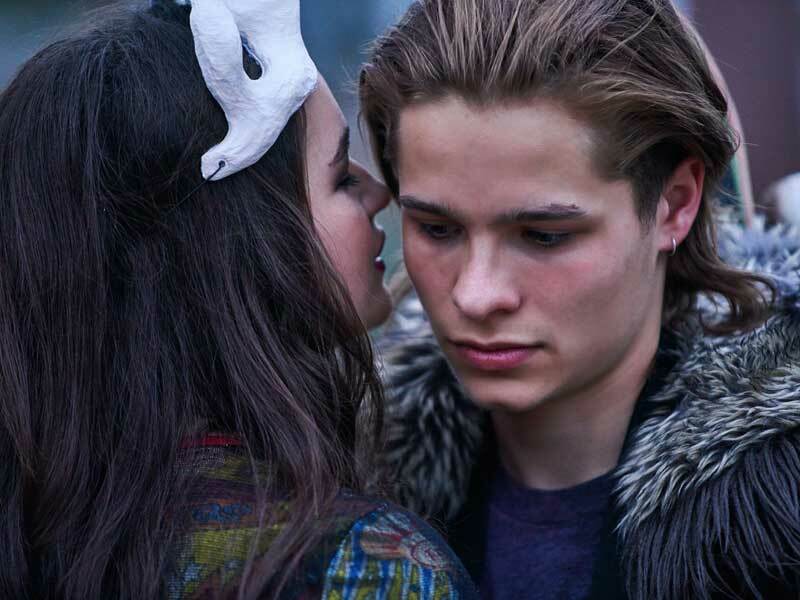 “Billy is definitely the adult in the relationship,” says Angel, 16, who launched his career 11 years ago, starring with Jessica Chastain in Jolene, attaining teen heartthrob status in Disney TV series, Andi Mack. Based on the DC Comics character of the same name, Shazam! 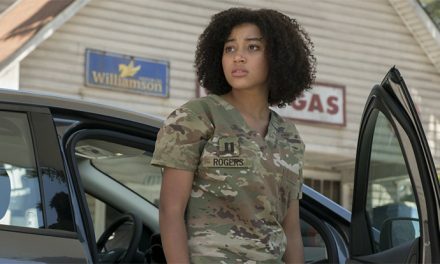 joins Batman, Superman, Wonder Woman, Aquaman, The Flash, Birds of Prey, Suicide Squad and rumoured Black Adam franchises in a box-office battle against Warner Bros.’ Marvel rivals. If Shazam!’s family-friendly comedic style ventures into new territory within the DC Extended Universe’s mainly serious superhero roster, then director David F. Sandberg comes ready to play. “I‘m not sure why they asked me,” laughs the director best known for his horror movies, Lights Out and Annabelle: Creation. “But I have a very good relationship with the studio and they knew I wanted to try other things. In some ways there are similarities to my last movie given that it’s an orphanage with all these kids. It’s not a monster movie but there are bad guys so I was happy to accept the challenge. Relishing his role in bringing the current DCEU into uncharted territory, he says, “He’s just a fun superhero. “I love that he’s a child at heart, which both gives you that joy of ‘Holy sh–t! I can do all these things!’ but also gives him the immaturity of not being able to handle the powers in a good way. Shazam! is in cinemas on April 4 and you can pre-order your copy at JB Hi-Fi now.